Madd Dogg is a character in Grand Theft Auto: San Andreas, and is a rich and famous gangsta rapper from Los Santos. He is based on Ice-T (who voiced the character) as well as Dr. Dre and Ice Cube of N.W.A. (whose music make up over half the Radio Los Santos soundtrack). The name "Dogg" is derived from Snoop Dogg and/or Nate Dogg. He was romantically involved with female rapper and R&B musician, Rochell'le. Forgotten Legends explains that Madd Dogg first gained extreme popularity as a rapper, without any full albums, in the late 1980s. He quickly earned enough money to buy his trademark mansion, pictured on his first two albums. The home resembles the "Hammertime" mansion in Fremont, California once owned by MC Hammer, as well as styling cues from homes owned by Ice-T. In 1990 he released Hustlin' Like Gangstaz (parody of Above The Law's Livin Like Hustlers, produced by Dr. Dre and featured on Radio Los Santos) and Still Madd (parody of Ice-T's OG: Original Gangster, complete with a song "2:30 in the Afternoon" to parody "6 in the Morning"). Before or during 1990, he also began a relationship with Rochell'le, a bubbly, innocent female singer and labelmate on Jimmy Silverman's Blastin' Fools Records. A rumor exists that he was her ghostwriter for some of the more rap-oriented songs she released. In 1991, he released 24 Carat Dogg. The name might suggest that he had moved on from violent music to more radio-friendly songs in which he bragged about his lifestyle, like many rappers, but in 1992 it seems that he still has plenty of street credibility. 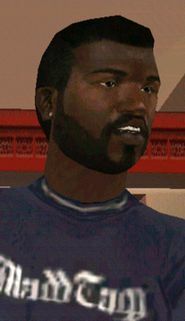 At the beginning of GTA San Andreas, Madd Dogg was very popular and exploring merchandise such as a clothing label "Madd Tagg" - later in the game, the player can buy one of the shirts for $36 at Victim. In real life, Russell Simmons was the first person in hip-hop to have his own clothing line in 1992, called Phat Farm. Madd Dogg began to sink into a depression after his rhyme book went missing and his manager was killed (all secret efforts by Carl Johnson - ironically, his future manager - to jumpstart rival OG Loc's music career). Outside of these attacks, he also struggled with "alcoholism and egomania" (as told by Lianne Forget), drug abuse, massive financial debt, as well as breakups with Rochell'le and his rap group "Doggy Boyz". Later that year, he was forced to give his mansion to a Vagos drug lord, and was supposed to give a concert in Las Venturas before he went missing. When Carl Johnson finds him, he had a room at the Royale Casino, and after he had gotten drunk and gambled away his fortune, threatens suicide before CJ saved him and sent him to rehab. Madd Dogg then hires CJ as his new manager, unaware that CJ ruined his career in the first place and rescued him out of guilt. In 1994, he released "the less-than-stellar" N.L.A.D.B. (Never Leave A Dog Behind), which would become his last album and direct him to retire. As of 1998 and 2003, his albums Still Madd and Forty Dogg were digitally remastered. Despite him saying he gets his first gold record at the end of the game you can see gold records all over his mansion. He may be referencing the first gold record that the 'team' got together, though this is unknown. It also seems highly unlikely that he'd never had a gold record if he lives in such a large, expensive mansion. His name may also be a reference to the 20th Century Irish mob hitman Vincent Coll, who was nicknamed "Mad Dog". The two share very little, if anything, in common, though.